Rainbow Place also offers on-site respite care. This helps to ensure the whole family/whānau get the support (and sleep) needed. Our focus in the In-Patient Unit (IPU) is on managing your child’s symptoms and improving quality of life, working in partnership with you in order to provide you with the very best individualised care possible. Our team includes specialist paediatric palliative care nurses who work closely with your child's Lead Paediatrician to plan your child's care, working in partnership with the parents at all times. We recognise that you are the experts in your child's care and the care we offer is always determined by your child needs. It is our priority to ensure your child is as comfortable as possible whilst in IPU. IPU patients have access to our Family Services team which includes social workers, counsellors, spiritual care coordinator, music therapist, volunteers and massage therapist, unless you are receiving this care from another agency such as True Colours or a Social Services agency. Our team is committed to providing holistic care and respecting your cultural and spiritual needs. Our skilled professionals provide clinical support with care and compassion. Time spent identifying the needs of you and your family/ whānau will help ensure that treatment and care is the best possible. This approach is central to our philosophy. Our dedicated children's room is private and spacious, with its own en suite, TV, and outdoor area. Lounge areas with kitchenettes are available for use by patients, family/whānau and friends. How can we be referred to IPU? The child needs to be referred to Rainbow Place and then onto IPU. Requests for admission are individually assessed according to need. Patients may be referred to Rainbow Place by their general practitioner, specialist doctor or Rainbow Place nurse. Respite care for Rainbow Place patients is normally limited to 10 nights a year, extra nights can be made available (subject to demand) after consultation with your Rainbow Place nurse or IPU Team Leader. What is provided by Rainbow Place? IPU offers warm, spacious rooms, including appropriate safe sleeping equipment, ensuite including a TV, game console if required, small fridge and a comfy sofa bed. All staff have been trained in safe manual handling of patients and have access to a hoist, including paediatric slings (for children). All meals are provided for the patient and carer. A relaxed family room and kitchenette, for sharing time with patients and family or visitors. A quiet room for reflection. An attractive private garden area. 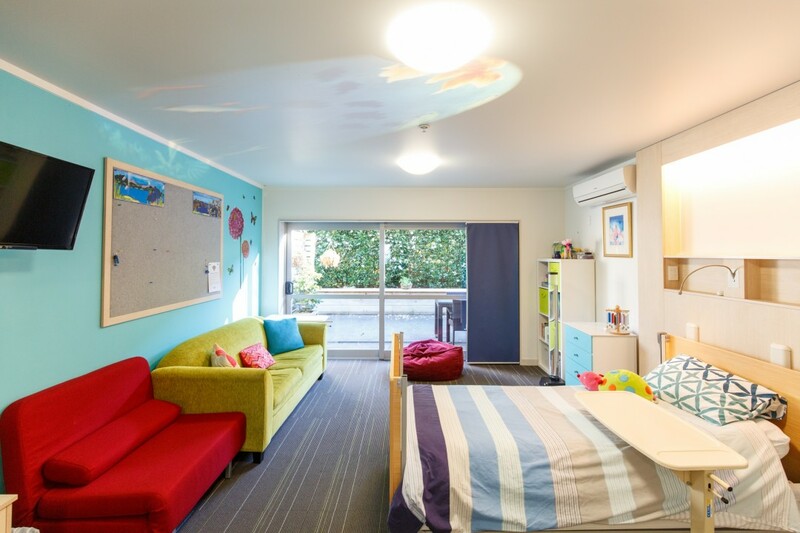 A whānau room is available for family to stay on site, when travelling from outside of Hamilton, by prior arrangement. All medications including emergency rescue medications. Please ensure all medications are clearly labelled with name of the patient, medication dose and frequency. N.B. Rainbow Place nurses and doctors will only give what is stated on the bottle or packet. Any change in the dosage from the date of the medication being prescribed must be accompanied by documentation from your doctor, specialist or paediatrician. A family/whānau unit for our rural families is available. This is usually reserved for families of patients who are in ‘End of Life’ care.